محمدی مهر, مهدی, اخوان علوی, سید محمد, اخروی, سید وحید. (1395). تحلیل کمانش و ارتعاشات آزاد پنل استوانه‌ای تقویت شده با توزیع‌های مختلف نانو لوله‌های کربنی بر بستر الاستیک. نشریه پژوهشی مهندسی مکانیک ایران, 18(3), 19-44. مهدی محمدی مهر; سید محمد اخوان علوی; سید وحید اخروی. "تحلیل کمانش و ارتعاشات آزاد پنل استوانه‌ای تقویت شده با توزیع‌های مختلف نانو لوله‌های کربنی بر بستر الاستیک". نشریه پژوهشی مهندسی مکانیک ایران, 18, 3, 1395, 19-44. محمدی مهر, مهدی, اخوان علوی, سید محمد, اخروی, سید وحید. (1395). 'تحلیل کمانش و ارتعاشات آزاد پنل استوانه‌ای تقویت شده با توزیع‌های مختلف نانو لوله‌های کربنی بر بستر الاستیک', نشریه پژوهشی مهندسی مکانیک ایران, 18(3), pp. 19-44. محمدی مهر, مهدی, اخوان علوی, سید محمد, اخروی, سید وحید. تحلیل کمانش و ارتعاشات آزاد پنل استوانه‌ای تقویت شده با توزیع‌های مختلف نانو لوله‌های کربنی بر بستر الاستیک. نشریه پژوهشی مهندسی مکانیک ایران, 1395; 18(3): 19-44. کمانش و ارتعاشات پنل استونه‌ای تقویت شده با توزیع‌های مختلف نانو لوله‌های کربنی برای دو حالت یکنواخت و مدرج تابعی مورد بررسی قرار می‌گیرد. معادلات دیفرانسیل حاکم بر پنل استوانه‌ای بر اساس تئوری تغییر شکل برشی مرتبه اول با استفاده از روش انرژی به‌دست می‌آید. همچنین از قانون اختلاط، برای تعیین خواص پوسته استوانه‌ای استفاده می‌شود. می‌توان نتیجه گرفت که با انتخاب مناسب توزیع نانو لوله کربنی و کسر حجمی سفتی سازه افزایش یافته و در نتیجه بار کمانش بحرانی و فرکانسهای طبیعی پنل استوانه‌ای افزایش می‌یابد. لذا این نکته در طراحی بهینه سازه‌ها در مقیاس نانو حائز اهمیت می‌باشد. Mehrabadi, S.J., Karimi Samar, R., and Bohluli, M.," Mechanical Buckling Analysis of Open Circular Cylindrical Shells Reinforced with Single Walled Carbon Nanotubes", Aerospace Mech, Vol. 9, No. 4, pp. 51-59, (2013). Raoufi, M., Jafari Mehrabadi, S., and Satouri, S.," Free Vibration Analysis of 2D-FGM Annular Sectorial Moderately Thick Plate Resting on Elastic Foundation using 2D-DQM Solution", Modares Mechanical Engineering, Vol. 14, No. 15, pp. 299-306, (2015). 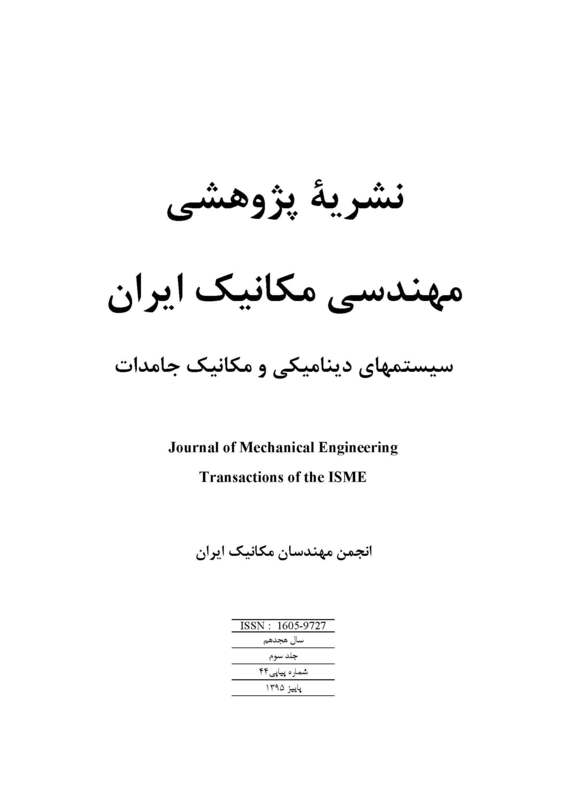 GhorbanpourArani, A., Haghparast, E., Khoddami Maraghi, Z., and Amir, S.," Nonlocal Vibration and Instability Analysis of Embedded DWCNT Conveying Fluid under Magnetic Field with Slip Conditions Consideration", Journal of Mechanical Engineering Science, Vol. 229, pp. 349-363, (2015). Seidel, G.D., and Lagoudas, D.C., "Micromechanical Analysis of the Effective Elastic Properties of Carbon Nanotube Reinforced Composites, Mechanical. Materials", Vol. 38, No. 8, pp. 884–907, (2006). Shen, H.S., and Zhu, Z.H., "Buckling and Post Buckling Behavior of Functionally Graded Nanotube-reinforced Composite Plates in Thermal Environments", Computational Materials Science, Continua, Vol. 18, No. 2, pp. 155–162, (2010). Ke, L.L., Yang, J., and Kitipornchai, S.," Nonlinear Free Reinforced Composite Beams", Composite Structures, Vol. 92, No. 3, pp. 676–683, (2010). Le, Z.X., Liew, K.M., and Yu, J.L.," Free Vibration Analysis of Functionally Graded Carbon Nanotube-reinforced Composite Plates using the Element-free Kp-Ritz Method in Thermal Environment", Composite Structures, Vol. 106, pp. 128-138, (2013). Phadikar, J.K., and Pradhan, S.C.," Variational Formulation and Finite Element Analysis for Nonlocal Elastic Nanobeams and Nanoplates", Computational Materials Science, Vol. 49, No. 3, pp. 492-499, (2010). Mohammadimehr, M., Mohandes, M., and Moradi, M.,"Size Dependent Effect on the Buckling and Vibration Analysis of Double-bonded Nanocomposite Piezoelectric Plate Reinforced by Boron Nitride Nanotube Based on Modified Couple Stress Theory", Journal of Vibration and Control, SAGE Publicatio, Vol. 22, No. 7, pp. 1790-1807, (2016). Ghannadpour, S.A.M., Mohammadi, B., and Fazilati, J., "Bending, Buckling and Vibration Problems of Nonlocal Euler Beams using Ritz Method", Composite Structures, Vol. 96, pp. 584-589, (2013). Mohammadimehr, M., Salami, M., Nasiri, H., and Afshari, H.," Thermal Effect on Deflection, Critical Buckling Load and Vibration of Nonlocal Euler-Bernoulli Beam on Pasternak Foundation using Ritz Method", Modares Mechanical Engineering, Vol. 13, No. 11, pp. 64-76, (2013). Abdelrazek, E.M., Hezma, A.M., El-khodary, A., and Elzayat, A.M., “Spectroscopic Studies and Thermal Properties of PCL/PMMA Biopolymer Blend”, Egyptian Journal of Basic and Applied Sciences, Vol. 3, No. 1, pp. 10-15, (2016). Shen, H.S.," Post Buckling of Nanotube-reinforced Composite Cylindrical Shells in Thermal Environments", Part I: Axially-loaded Shells, Composite Structures, Vol. 93 pp. 2096-2108, (2011). Alibeigloo, A., and Shaban, M.," Elasticity Solution of Functionally Graded Carbon Nanotube-reinforced Composite Cylindrical Panel Subjected to Thermo Mechanical Load ", Composites Part B, Vol. 87, pp. 214-226, (2016). Jafari Mehrabadi, S., Jalilian Rad, M., and Zarouni, E.," Free Vibration Analysis of Nanotube-reinforced Composite Truncatedconical Shell Resting on Elastic Foundation", Modares Mechanical Engineering, Vol. 14, No. 12, pp. 122-132, (2014). GhorbanpourArani, A., Kolahchi, R., Khoddami Maraghi, Z., “Nonlinear Vibration and Instability of Embedded Double-walled Boron Nitride Nanotubes Based on Nonlocal Cylindrical Shell Theory”, Applied Mathematical Modelling, Vol. 37, pp. 7685–7707, (2013). Abolghasemi, S., Eipakchi, H., and Shariati, M., "Analytical Solution for Buckling of Rectangular Plates Subjected to Nonuniform In-plane Loading Based on First Order Shear Deformation Theory", Modares Mechanical Engineering, Vol. 14, No. 13, pp. 37-46, (2014). Sohani, F., and Eipakchi, H.R., "A Survey on Free Vibration and Buckling of a Beam with Moderately Large Deflection using First Order Shear Deformation Theory", Modares Mechanical Engineering, Vol. 13, No. 14, pp. 1-14, (2014). Bakhsheshy, A., and Khorshidi, K., "Free Vibration of Functionally Graded Rectangular Nanoplates in Thermal Environment Based on the Modified Couple Stress Theory", Modares Mechanical Engineering, Vol. 99, No. 9, pp. 1-8, (2014). Mohammadi, M., Farajpour, A., Moradi, A., and Ghayour, M.," Shear Buckling of Orthotropic Rectangular Graphene Sheet Embedded in an Elastic Medium in Thermal Environment", Composites Part B: Engineering, Elsevier, Vol. 56, pp. 629-637, (2014). Mohammadimehr, M., Salemi, M., and RoustaNavi, B., "Bending, Buckling, and Free Vibration Analysis of MSGT Microcomposite Reddy Plate Reinforced by FG-SWCNTs with Temperature-dependent Material Properties under Hydro-thermo-mechanical Loadings using DQM", Composite Structures, Vol. 138, pp. 361-380, (2016). Mohammadimehr, M., RoustaNavi, B., and GhorbanpourArani, A., "Free Vibration of Viscoelastic Double-bonded Polymeric Nanocomposite Plates Reinforced by FG-SWCNTs using MSGT, Sinusoidal Shear Deformation Theory and Meshless Method", Composite Structures, Vol. 131, pp. 654-671, (2015).